Inner west of Brisbane. Paddington covers the suburbs of Kelvin Grove, Auchenflower, Milton and Paddington immediately to the west of the Brisbane CBD. Map of Paddington’s 2012 and 2016 boundaries. 2012 boundaries marked as red lines, 2016 boundaries marked as white area. Click to enlarge. 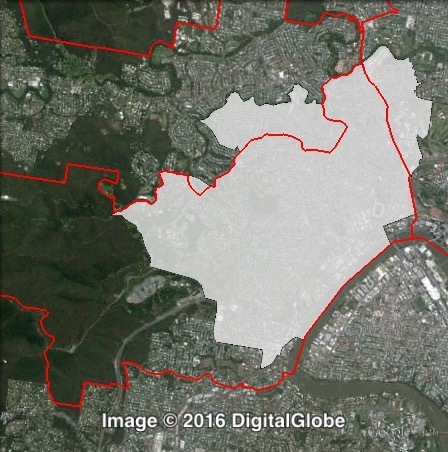 Paddington is a new name for the former ward of Toowong. The ward was renamed after shifting to the north and east, and losing parts of Toowong to Walter Taylor ward. In exchange, Paddington gained the balance of Kelvin Grove from Central ward, and parts of Ashgrove and Bardon from The Gap. These changes only slightly changed the margin, increasing the LNP council margin from 12.1% to 12.4%, and cutting the mayoral margin from 18.7% to 18.3%. The Toowong ward was created in 1994 as a merger of Liberal-held Taringa ward and Labor-held Paddington ward, and was won in 1994 by new Liberal councillor Judy Magub. Magub was re-elected in 1997, 2000 and 2004, and retired in 2007. In the lead-up to the 2008 election, the Liberal margin in Toowong was cut from 12.7% to 1.8%. Liberal councillor Peter Matic was appointed to the casual vacancy, and was re-elected in 2008 with a 10% swing. In 2012, Matic was elected to a second full term with a slim 0.3% swing. He currently serves as Chairman of the Public and Active Transport Committee. The ward in this area was extremely marginal before the large swings to the LNP in 2008, and Labor would be hoping to regain this ward, the LNP’s fourth most marginal. The Greens are less than 5% behind Labor and would be hopeful about overtaking Labor. Whichever progressive party comes second, they will need a strong flow of preferences to overcome the LNP. Polling places in Paddington at the 2012 Brisbane City Council election. North-East in green, North-West in blue, South in orange. Click to enlarge. Booths in Paddington have been split into three parts: north-east, north-west and south. The LNP primary vote for the council election ranged from 48.4% in the north-east to 57% in the south. The Labor vote was highest in the north-east and lowest in the north-west. The Greens vote was lowest in the south and highest in the north-east. Liberal National primary votes for councillor in Paddington at the 2012 Brisbane City Council election. Labor primary votes for councillor in Paddington at the 2012 Brisbane City Council election. Greens primary votes for councillor in Paddington at the 2012 Brisbane City Council election.